Iconic God of War series anti-hero Kratos has been giving gods and peasants alike a taste of steel for 13 years now, and he doesn't look to be stopping any time soon. While his latest outing is taking a somewhat different direction thanks to the inclusion of his son and all-new elements based around the Norse myths, Kratos' past is still deeply steeped in Greek mythology as well as the blood of all those who have dared to oppose his will. Fans who want to catch up on the tales and legends forged within the God of War series would do well to brush up on some of the many plots and characters featured in the series so far. Fortunately, we're here to help. It's been eight long years since the God of War series has had a proper full-form release, and as such, the team at Sony have provided a quick video summing up some of the history fans will want to keep in mind before diving into the new adventure. However, we know that some gamers will crave a much more detailed story synopsis, and we're happy to provide. Those who have completed past games in the series will find an overview of Kratos' exploits featured below, but those who haven't played past series entries should know that the information featured beyond this point contains plot details and spoilers for many of the past God of War games. Kratos begins his tale as a Spartan warrior in service to the gods — specifically the many deities present in the traditional Greek pantheon. During one fateful battle with an overwhelming barbarian force, Kratos called out to Ares, the Greek god of war, with a promise to serve his will if Ares was willing to imbue Kratos with the power to smite his foes. Kratos' wish was granted, but it came at a cost — Ares bound the Blades of Chaos to Kratos' body, forever chaining the man to a fate filled with destruction. Both blessed and cursed by power unrelenting, Kratos carved a path of fire and destruction throughout the land, killing many foes and drawing the ire of many Greek gods. One such battle lead Kratos to a village where he killed a number of worshipers of Athena, and during the frey, blinded by the red mist, Kratos inadvertently murdered his own wife and daughter. The village's Oracle then bound the ashes of his fallen family members to Kratos' body, giving him his signature pallid complexion and serving as a constant reminder of the evil he'd brought upon the world. Haunted by visions of his past and growing weary from sleepless nightmare-filled nights, the Ghost of Sparta made a vow to serve the other gods in an effort to rid himself of his own personal demons. Kratos went on to undertake on a number of missions for various gods, killing man and beast alike, before Athena ultimately tasked him with killing Ares. The ensuing questline saw Kratos seek out the power of Pandora's Box, the only artifact capable of allowing a mortal to kill a god. After tracking down and opening Pandora's Box, Kratos grew in size and in stature in order to find equal footing in the battle against Ares. The two fought for some time, with Ares eventually stripping Kratos of the Blades of Chaos and all resulting magical powers. 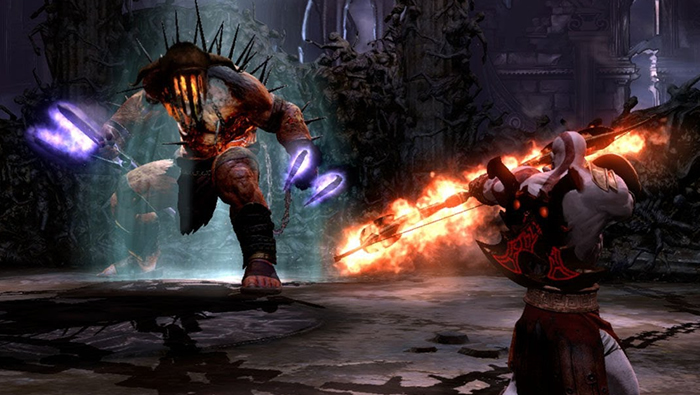 However, with the newly-acquired Blade of the Gods in-hand, Kratos ultimately managed to kill Ares. In an unfortunate twist, however, Athena and the other gods refused to rid Kratos of his nightmares. Angered by the gods' cruelty, Kratos cast himself into the Aegean Sea, but before he drowned, Athena plucked him from the water and took him to Mount Olympus, from where he was given reign as the new God of War. 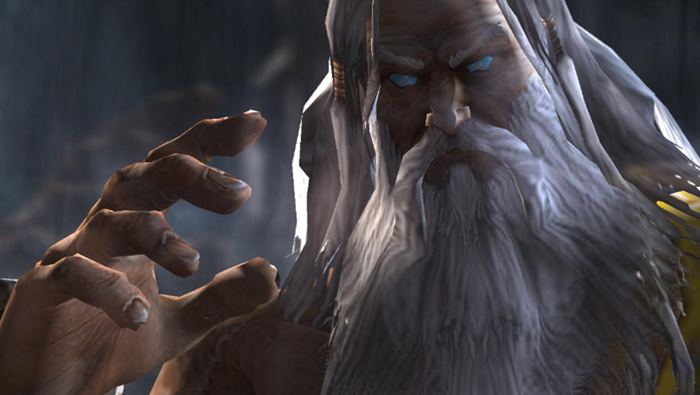 The story in God of War 2 saw Kratos returning to a mortal form. After joining up with the Spartan army in an attack on Rhodes, an eagle swooped over the battlefield, drawing Kratos' power away from him and giving life to the Colossus of Rhodes. With his power nearly depleted, Kratos stood little chance of victory; seeing an opportunity for divine intervention, Zeus appeared and gave Kratos the Blade of Olympus, a sword bearing the last of Kratos' power, which Kratos used to fell the statue. Mortally wounded, Kratos watched as the eagle morphed into Zeus, who then admitted that he devised the plan in order to strip Kratos of his powers. After Kratos refused a final chance to pledge loyalty to the gods, Zeus struck him down. Before Kratos could be dragged into the Underworld, he was saved by the titan Gaia, who informed him of the powers held by the Sisters of Fate, a set of siblings said to wield influence over time itself. From there, Kratos struck out on an adventure that saw him confronting Typhon, Prometheus, a Kraken, and even some of the more powerful foes from his past. Kratos eventually stumbled upon the sisters Atropos and Lakhesis, the likes of which refused to offer him their power or services. A battle ensued where Kratos fought with the sisters as well as Ares in a sort of time-shifting conflict. Ultimately, the two sisters as well as the third, Clotho, fell, and Kratos used the Loom of Fate to return to the point in time when he was betrayed by Zeus. Emboldened by knowledge of a future that could come to pass, Kratos used the Blade of Olympus to subdue Zeus. Before he could kill the god, however, Athena jumped in front of the sword, impaling herself in order to save Zeus. In her dying moments, Athena informed Kratos that he is in fact a son of Zeus, and that Zeus' plot to kill him was borne of the fear that Kratos would eventually usurp his throne, just as Zeus did with his father Cronos. Seeing a potential end to the madness, Kratos used the Loom of Fate to go back in time and rescue the Titans, the likes of which he then brought to the present, and the game ended shortly after Kratos and the Titans began to climb Mount Olympus, intending to put an end the reign of the Greek gods. God of War 3 picked up right where God of War 2 left off, with Kratos riding on the back of Gaia as he and the swarm of Titans ascended Mount Olympus. Poseidon rose from the sea to fend off the attackers but fell at the hand of Kratos, and his death resulted in a flood that swept over the whole of Greece. Zeus at last managed to resist the attackers, pushing Kratos and the Titans off the mountaintop. As Kratos clang to Gaia, she informed him that he was nothing more than a pawn in their grand scheme, ultimately casting Kratos into the depths of the River Styx. His plot in shambles and his weapons destroyed, Kratos was visited by the ghost of Athena, who informed him that her new spiritual form has granted her insight into truths that were once shrouded — namely that mankind will never flourish so long as Zeus is in power. She gifted Kratos with the Blades of Exile, and the two formed a plan to have Kratos extinguish the Flame of Olympus. Kratos broke free of the Underworld, recovered the Blade of Olympus, and eventually killed Hades, an act which set free the souls of those previously trapped in the realm. Kratos' path of destruction became tremendous, with the Ghost of Sparta encountering numerous other titans as well as gods like Hermes, who helped him find the Chamber of the Flame and Pandora's Box within it, the likes of which Kratos needed to conquer Olympus. Kratos eventually traveled to the Forum to speak with the god Hera, who refused to help him on his path, as well as Aphrodite, who didn't care enough about the situation to take any sort of action. Only Hephaestus had a plan of action, sending Kratos to Tartarus in order to recover the Omphalos Stone, which could be used to forge a weapon capable of killing Zeus. Kratos located and slayed the titan Cronos, recovered the stone, and gave it to Hephaestus, who used it to forge a powerful magical weapon. Unfortunately, Hephaestus tried to use the weapon to kill Kratos, resulting in his own demise. With the weapon in hand, Kratos made his way toward the Labyrinth and rescued Pandora, who urged him to break the Chain of Balance so that the two may reach Pandora's Box. After finding it, Zeus stepped in to defend the box; Kratos and Zeus battled, but ultimately Pandora sacrificed herself to quench the Flame of Olympus. Kratos then opened Pandora's Box only to find nothing inside. Zeus mocked Kratos' efforts, and the two once again did battle. Gaia showed up to kill them both, but their battle was so fierce that Zeus and Kratos wound up fighting within Gaia herself. Kratos eventually managed to impale both Zeus and the heart of Gaia with the Blade of Olympus, killing them both with a single blow. Before he could leave, however, the spirit of Zeus stripped Kratos of all his weapons, and the two resumed their battle once again. During the conflict, Kratos was knocked unconscious, spurring Pandora to pull Kratos into his own mind, where he communed with the spiritual forms of his fallen wife and daughter, eventually finding a way to forgive himself for his past transgressions. Emboldened by his newfound hope, Kratos reawakened, and ultimately managed to beat Zeus to death with his bare hands. Facing his own mortality, Kratos slumped over in victory and watched as the spirit of Athena left him alone. The credits roll, but before the game ended, a post-credits scene showed the Blade of Olympus sitting abandoned with a trail of blood smeared on the ground leading away from the weapon. By now, players should be caught up with all of the highlights leading up to the latest God of War release. To learn more about Kratos' more recent exploits, including guides and features for the PlayStation 4 release, check out our God of War walkthrough and guide.